May | 2017 | Let Teddy Win! If learning about obscure holidays is your thing, there are worse places to start than the Nats’ presidents race. 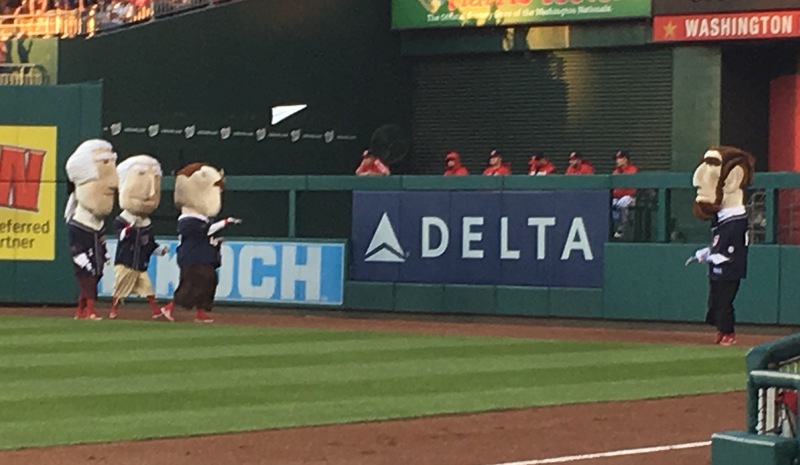 During Friday night’s fourth inning, fans at Nationals Park learned that it was National Paper Airplane Day when master trickster Abe Lincoln interrupted the race to toss a paper airplane with his fellow presidents. Lincoln stopped George, Tom, and Teddy by floating a giant paper airplane in their direction, then coaxed them to get it and toss it back. Of course, when they paused to send the airplane flying back towards him, “Honest” Abe turned and bolted for the finish line. Abe’s latest victory means Teddy Roosevelt is now 0-for-23 on the season.